Many bloggers have been choosing a word of the year for a few years, a word that they want to focus on for the upcoming year. Maybe it is something they want to invite more into their lives, or a reminder of goals. But whatever the reason for choosing the word, it is a very powerful way of stating intentions to the Universe. And the Universe has a way of responding. There was some big joy in my life in 2009. I bought a house – a big, beautiful house, with enough space for me to have an art studio, and a library. I got married to the love of my life in a perfect, magic mermaid beach wedding. We honeymooned in Belize, relaxing, swimming, diving, and spending time together after an incredibly hectic start of the year. I cut off my mermaid curls and went back to really short hair, and totally love it. I started Flying Mermaid Photography and fell more and more in love with photography.We spent Thanksgiving in Seattle with my awesome brother-in-law, and had an amazing time. But, the last half of the year has been very challenging with my health. The struggles, the frustrations, the pain, the tears, the emergency room visit, the urgent care visit…they have defined the last half of this year. I have felt trapped and attacked by my body. I have lost some of my joy. For the first time, I decided to participate in choosing a word of the year. And for 2010, it is Joy. I am welcoming and inviting joy into my life. And I know that sometimes, I will have to look for it. But I’m hoping that by choosing this as my word, it will remind me to always stop and find out where Joy might be, even when it seems like Joy is nowhere to be found. It’s there somewhere. Like the photo of the Joy wreath at the top of this post. I was out of my steroid skin cream. My skin was broken out. We were going to go out and buy our Christmas tree. I had been given a new prescription for a different skin cream, one I had used in Portland, and I remembered it didn’t work very well. But I put it on, figuring it would help at least a little. Right after I put the cream on, we left to go Christmas tree shopping. And once we were at Home Depot, my skin started to explode. I was insanely itchy. I started to get really hot. I was having a severe allergic reaction to the cream I had put on. But I found this wreath when we were there, maybe an hour or so after I had announced that I was choosing Joy for my word of the year for 2010. 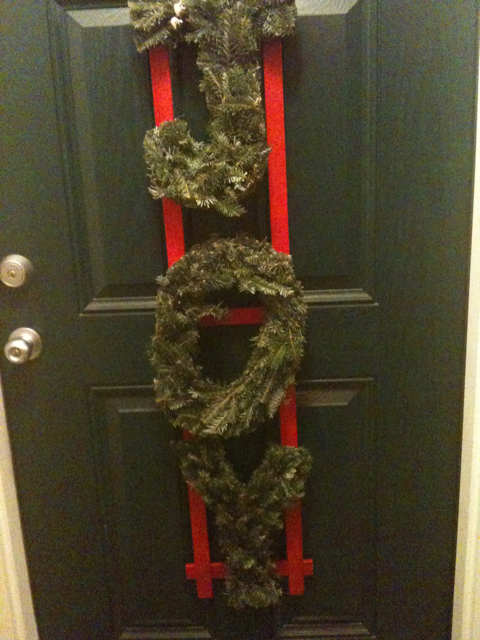 A Joy wreath to hang on my front door, and invite joy into my home. I took it as a sign from the Universe that joy can be there even in the worst pain. It might be small, but it is still there. 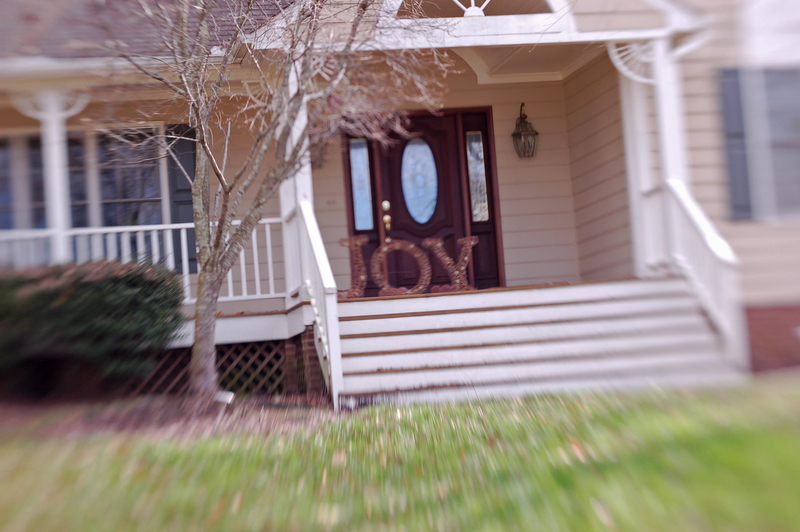 Since declaring Joy my word of the year, I have started seeing Joy pop up everywhere. And every time it does, I pause, even just for a second, to say to myself, yes, Joy is here. 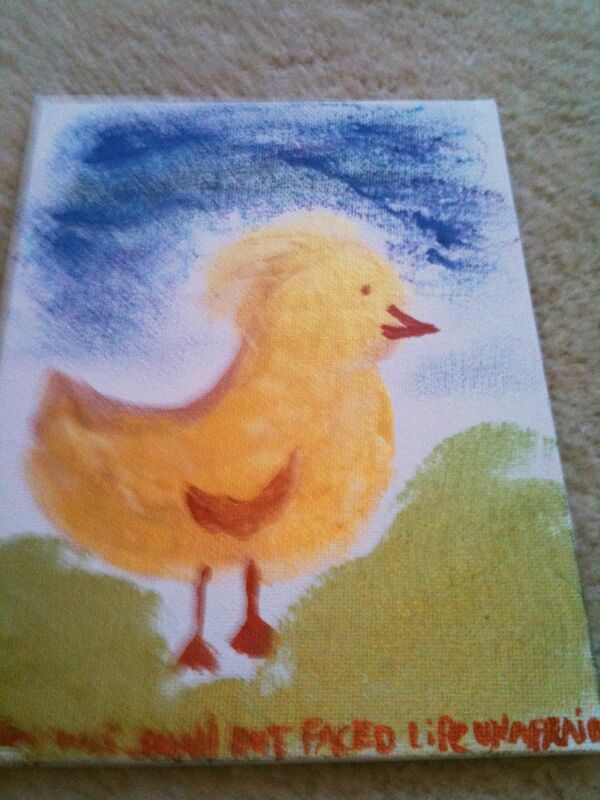 I even painted a little joy painting for myself – the bottom reads, joy was small but faced life unafraid. Welcome Joy, I look forward to finding you and celebrating you, big and small, in 2010.